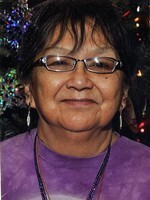 Provide comfort for the family of Theresa Sinoway with a meaningful gesture of sympathy. Who quietly passed away at Roseview Manor on February 1, 2019 with her family by her side. Predeceased by her mom and dad Marie and Simon Sinoway, her 2 daughters Claudette and Veronica, and nephews Aaron and Daniel. She will be sadly missed by her son Michael “Oats” Sinoway, grandchildren: Nicholas, Jasmine and Brody, sisters Mary “Doni” Niemi, Hazel, Marilyn, brothers Harry, Frankie “Brenda”, Robert “Hilda”, Paul “Jacqueln”, Maurice “Isabel”, Edna and Gladys, Madeliene, nieces Dehlia “Larry”, Roxanne, Candida “Rob”, nephew Jacques Schimitt, godchildren Tracy, Shyla, Chance, Nero and Shanelle, uncles, aunties in Gull Bay, numerous cousins and other relatives. A special thank you to Loretta Nelson for all her help. Funeral services will be Tuesday (Today), February 5, 2019 at 11:00 am in the Chapel of the Sargent & Son Funeral Home, 21 N. Court Street. Visitation will be held one hour prior to service. A very special thank you to the doctors and staff of Roseview Manor for their beautiful hospitality. To send flowers in memory of Theresa Sinoway, please visit our Heartfelt Sympathies Store. Provide comfort for the family of Theresa Sinoway by sending flowers.